SpongeBob SquarePants: The Broadway Musical will conclude its Broadway engagement at the Palace Theatre (1564 Broadway at West 47th Street) on Sunday, September 16, 2018, due to previously planned theatre renovations beginning mid-September. Early in 2019, school and youth group licensing rights will be available, with professional licensing to follow. Additionally, a North American tour will begin fall 2019 (cities, venue engagements and casting to be announced at a later date). The production, which began previews on November 6, 2017, and opened on December 4, 2017, will have played 327 regular performances and 29 previews. 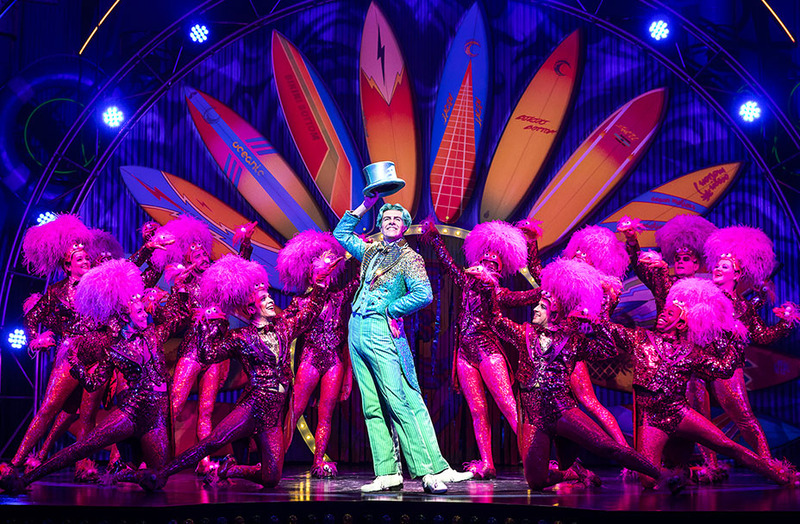 "Our bold reimagining of SpongeBob SquarePants as a musical has been embraced by SpongeBob fans and theatre-goers alike, who experienced the wonderous life in Bikini Bottom first-hand during the Broadway engagement in New York City" said Executive Producer Susan Vargo. "It will continue absorbing audiences across the country and around the world." 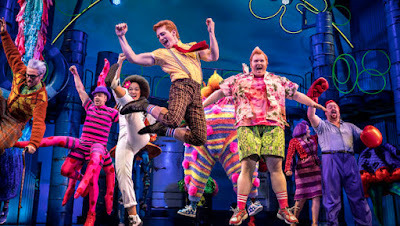 The critically acclaimed SpongeBob SquarePants musical was named Best Musical by the Drama Desk Awards and Outer Critics Circle and earned 12 Tony Award nominations - the most nominated musical of the 2017-2018 theatre season - winning for Best Scenic Design of a Musical (David Zinn). Following a Chicago tryout, it began previews at the Palace Nov. 6 and officially opened Dec. 4, defying critical expectations by earning some of the warmest reviews of the season. While many expected a theme park-style brand extension, the show surprised theatergoers with its wild Dadaist comic sensibility, ingenious design and winning performances, notably from gifted 26-year-old newcomer Ethan Slater, making a terrific Broadway debut in the title role. While the official reason for the closing notice is the previously announced renovation of the Palace Theatre, scheduled to begin mid-September, Broadway pundits have been speculating for months about the future of such a costly show (reportedly capitalized at up to $18.35 million) consistently playing to less than 70 percent of its gross potential. 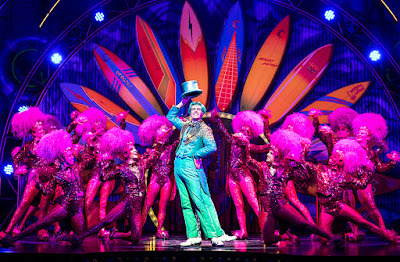 The musical's presence in the Tonys race, and a spot on the CBS telecast for the tap extravaganza "I'm Not a Loser," performed by nominee Gavin Lee as Squidward Q. Tentacles, pumped some fresh momentum into the box office. But the show still had not exceeded 75 percent of its gross potential since the lucrative week between Christmas and New Year's. Cumulative box office currently stands at $26.8 million. SpongeBob SquarePants explodes with energy and features an original pop and rock-infused score by a legendary roster of Grammy® Award-winning songwriters. Led and conceived by visionary director Tina Landau (2018 Tony Award nominee) and a Tony Award®-winning design team, the production brings the spirit of SpongeBob to life with humanity, heart, and pure theatricality. SpongeBob SquarePants features a book by Kyle Jarrow, music supervision, orchestrations and arrangements by Tom Kitt and choreography by Christopher Gattelli. The ensemble includes Brandon Espinoza, Alex Gibson, Gaelen Gilliland, Juliane Godfrey, Jordan Grubb, Kyle Matthew Hamilton, Curtis Holbrook, Jesse JP Johnson, L'ogan J'ones, Jai'len Christine Li Josey, Kelvin Moon Loh, Lauralyn Mcclelland, Vasthy Mompoint, Oneika Phillips, Catherine Ricafort, JC Schuster, Allysa Shorte, Abby C. Smith, Robert Taylor Jr., Allan K. Washington, Brynn Williams, Matt Wood and Tom Kenny as the French Narrator. SpongeBob SquarePants is a one-of-a-kind musical event with original songs by Yolanda Adams, Steven Tyler and Joe Perry of Aerosmith, Sara Bareilles, Jonathan Coulton, Alexander Ebert of Edward Sharpe & The Magnetic Zeros, The Flaming Lips, Lady Antebellum, Cyndi Lauper, John Legend, Panic! At the Disco, Plain White T's, They Might Be Giants and T.I., and a song by David Bowie and by Tom Kenny and Andy Paley. Additional lyrics by Jonathan Coulton. Additional music by Tom Kitt. The production earned 12 Tony Award nominations including best musical, equaling Mean Girls for the most of any show this season, and while The Band's Visit swept the honors, SpongeBob did score a deserved win for David Zinn's scenic design. The show’s director, Tina Landau, earned a Tony Award nomination for her inventive and unconventional approach to the material that humanized the characters than creating literal representations of the familiar Nickelodeon cartoon. The production was capitalized for up to $18.35 million, according to a filing with the Securities and Exchange Commission. Since its launch in July 1999, SpongeBob SquarePants has reigned as a pop culture phenomenon. The series has been the most-watched animated program with kids 2-11 for more than 15 consecutive years, and over the past several years, it has averaged more than 100,000,000 total viewers every quarter across all Nickelodeon networks. SpongeBob SquarePants is the most widely distributed property in Viacom history, seen in more than 208 countries and territories and translated in 55+ languages. Paramount Pictures' second feature film based on the property, The SpongeBob Movie: Sponge Out of Water, in 2015 at #1 opening weekend. A third feature, “It’s a Wonderful Sponge,” has been announced for summer 2020. The character-driven cartoon chronicles the nautical and sometimes nonsensical adventures of SpongeBob, an incurably optimist and earnest sea sponge, and his undersea friends, and will be celebrating its landmark 20th anniversary in 2019. The official reason given for the show’s close is because of previously-planned renovations to the Palace Theatre, the musical’s home, which will be elevated 29 feet above street level to create space for retail stores underneath it. However, if the musical had been even a moderate success, it certainly would have moved to another Broadway theater. But the show, which was capitalized at as much as $18.35 million, according to the New York Times, was playing to less than 70 percent of its gross potential each week, and will close without recouping its capitalization. The show’s closure represents a stumble for Nickelodeon, as the network had made the musical the centerpiece of its March upfront event, which was held at the Palace Theatre. Cyma Zarghami, who was still president of Nickelodeon Group at the time, told Adweek that the musical tied into Nickelodeon and Viacom’s reinvention theme for this year’s upfront. But Zarghami exited the company in June, after three decades at the network, and now SpongeBob is leaving Broadway. SpongeBob SquarePants: The Musical had been a big hit among Viacom’s advertisers, Viacom ad sales chief Sean Moran told Adweek in March. “We brought about 300 people to go see the show back in December, and we keep fielding requests from clients, agency folks, and even some of our competitors, who all want to bring their families there. So it’s been fantastic on so many levels,” he said. Nickelodeon had produced its first Broadway musical as part of Viacom’s push into more live events under Viacom CEO Bob Bakish. Last month, the Nickelodeon SlimeFest festival made its U.S. debut in Chicago. The Tony-award winning SpongeBob SquarePants: The Broadway Musical is now playing at the Palace Theatre (1564 Broadway at West 47th Street). For full information, reviews and tickets, visit http://spongebobbroadway.com. SpongeBob SquarePants - The New Musical Original Cast Recording is available to purchase today at https://spongebobmusical.lnk.to/SpongebobMusicalRecording. Original source: Broadway World; Additional source: The Hollywood Reporter, The New York Times, Playbill, Billboard. More Nick: David Zinn Wins 'Best Scenic Design of a Musical' 2018 Tony Award for 'SpongeBob SquarePants: The Broadway Musical'! Follow NickALive! on Twitter, Tumblr, Google+, via RSS, on Instagram, and/or Facebook for the latest Nickelodeon and SpongeBob SquarePants - The New Musical News and Highlights!